November 19, 1942 – A huge plan for “revitalizing” [Chicago Daily Tribune, November 20, 1942] the central part of the city is brought before the Chicago Plan Commission by H. Evert Kincaid, the Director of the Master Plan Division. The plan includes “a helicopter field, park areas with underground parking lots, consolidation of railroad terminals, and a civic center” bounded by Jackson Boulevard, and Madison, Wells and Clinton Streets. That plan would concentrate office buildings west of State Street, and would redevelop residential districts north of Chicago Avenue. 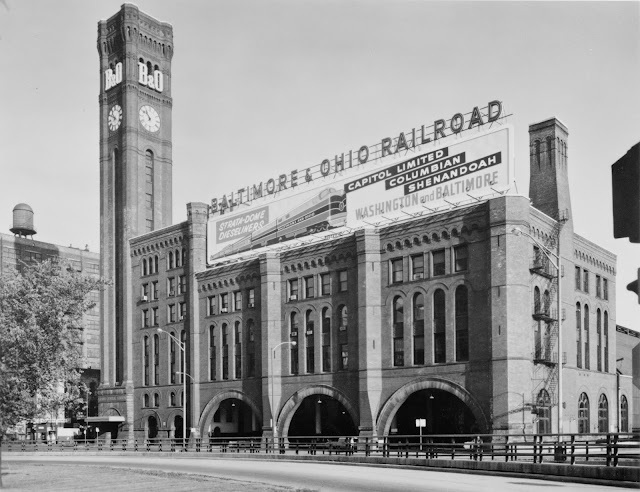 A proposal to relocate the Dearborn Street, LaSalle Street, and Baltimore and Ohio railroad stations to a site south of Taylor Street near State Street is also a part of the plan. The helicopter field would be placed north of the new civic center and west of the river. The Romanesque Grand Central Station, pictured above, was one of the stations for elimination as a new central terminal provided a more expedient way of getting railroad passengers in and out of the city. It made it until 1971 when it was torn down after 81 years of service. The site on which it stood is the site of a multi-residential building development called Southbank which will offer as many as 2,700 units i five high rises that surround a two-acre park. November 19, 1929 – The formal inauguration of Dr. Robert Maynard Hutchins as the fifth president of the University of Chicago is held. Noting the ceremony a Chicago Daily Tribune editorial states, “Chicago has reason to be proud of the great institution which bears its name and speaks for its highest aspiration before the world, an institution which we hope will be profoundly American though of world wide influence, a congregation of scholars, a mother of leaders in all fields of learning and honorable activity. And in this faith Chicago welcomes the new president upon the threshold of what we hope and believe will be a great accomplishment.” The selection of Hutchins was wise. Despite his age – he was barely 30-years-old when he assumed the office – he gave 64 public addresses in his first year at the university and appeared regularly on the radio and on the pages of popular magazines, raising his profile along with that of the school. During his tenure Hutchins re-organized the graduate departments into four academic divisions of the biological sciences, humanities, physical sciences, and social sciences, establishing a separate College for each division and unifying all undergraduate work under one dean. In 1939 he gained the support of the university trustees and eliminated varsity football. 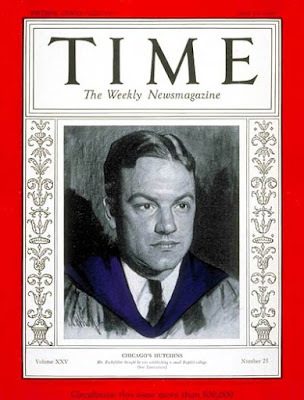 Under his leadership the university prospered, moving steadily forward during the 1930’s on money from generous donors during the previous decades and on funds from the Rockefeller Foundation. World War II saw millions of dollars in government contracts come to the university; in fact, the old football field was the site in which the Manhattan Project developed the atomic bomb. A staunch defender of academic freedom and proponent of world peace, Hutchins resigned in 1951 to become an associate director of the newly-formed Ford Foundation. November 19, 1978 – The Chicago Tribune reports on the “waterfront dream” of architect Harry Weese as he explains the vision for Wolf Point Landings that he has nurtured for over 15 years. “I first saw it back then and realized it would be a marvelous site for a new town of as many as 30,000 people,” says Weese. [Chicago Tribune, November 19, 1978] Back in the early 1960’s Weese bought a piece of river front land at Kinzie and Canal streets for about $12,000. It was not a great source of comfort to him. “I had always wanted a stretch of waterfront property. I wanted to park my boat there, but I was afraid of vandals,” he said. Times change, though, and in the preceding week new plans are announced for a huge residential project of two new condominium buildings, a 22-story residential building between Lake Street and Grand Avenue and the renovation of the North American Cold Storage building on Canal Street, a project that will create 122 residential units. 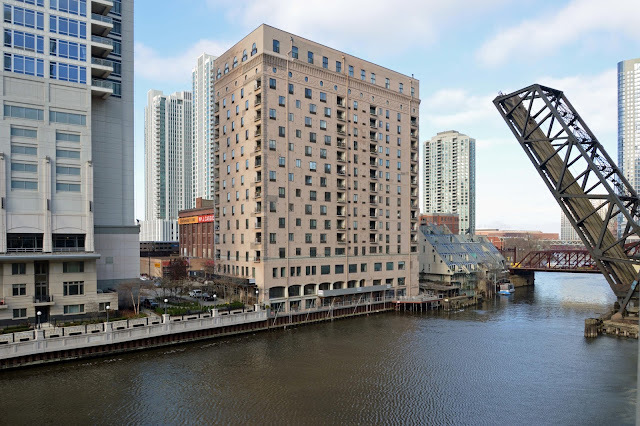 Weese was rhapsodic about the project, especially the view, saying, “We have very nice diagonal views of Water Tower Place and the entire Loop area to the south. And to the west, we’re wide open. We’ll see great sunsets, and a marvelous view of O”Hare Field.” The view is considerably different these days.